Tribe of Moles is Bella’s new weekly column reflecting struggles against benefits sanctions, austerity attacks and state repression – encouraging resistance, counter-power and autonomy. Imagine you have to attend a test which is going to decide if you have enough money to live on – or not. You don’t really understand exactly how they are going to make the decision. But you do know that growing numbers of people are failing the test and getting their income stopped. Of course a lot of Bella readers don’t have to imagine this. Anyone can become ill or develop a health condition. Thousands of people in Scotland have to go through the so-called Work Capability Assessments which decide whether or not they are going to be awarded the sickness/ disability benefit Employment Support Allowance. Your GP or specialist has said you are not fit for work – this counts for nothing. Your future will be decided by a private company with a brief to kick claimants off sickness benefits. The tests are run by the private company Maximus on behalf of the DWP – Maximus took over from the notorious ATOS, but little has changed bar the corporate logo. Attend any jobcentre and you will see plenty of people clearly incapable of working who Maximus have miraculously cured….. So imagine you’ve got to go to the test, at the Maximus assessment centre. Your health conditions include mental health issues. Your anxiety and stress is through the roof. But you find a welfare rights organisation. A worker there knows the rules and can accompany you. They are on your side. You are no longer facing this on your own. You go to the assessment centre with your advocate. But the Maximus people say your advocate can’t accompany you. They claim that he’s barred from the building – “on police advice”. Your advocate points out that everyone has the basic human right to be accompanied, by an advocate of their own choice, to Work Capability Assessments – or indeed any benefits interview. Leave or we call the police, Maximus tell your advocate. You can still have your appointment, but someone else can be your accompanist, Maximus tell YOU. Now you really are in a panic. You trust your advocate, you can’t just change your representative at the last-minute. You and your advocate agree to leave together, and get the appointment re-scheduled for later. As your advocate starts to leave Maximus employees try to slam the door shut behind him, to trap you in the building without him, to pressurise you to go through the test there and then. You manage to get out of the assessment centre. Then the police come and arrest your advocate. Important welfare powers are being devolved. We need to make it clear to the Scottish government that if this is to mean anything the DWP and all the private companies milking the poverty industry must be told that claimants have an absolute right to be accompanied by their own advocate. This nightmare happened to a woman claiming Employment and Support Allowance in Dundee, witnesses told Dundee Sheriff Court on 9 June. Witnesses recounted events when Fiona attended the Maximus Assessment Centre at Caledonian House Dundee on 15th November last year. Maximus refused to permit her advocate, Tony Cox, an activist with the Scottish Unemployed Workers Network, to accompany her and called the police. Dr Cox was arrested and held overnight in police cells. 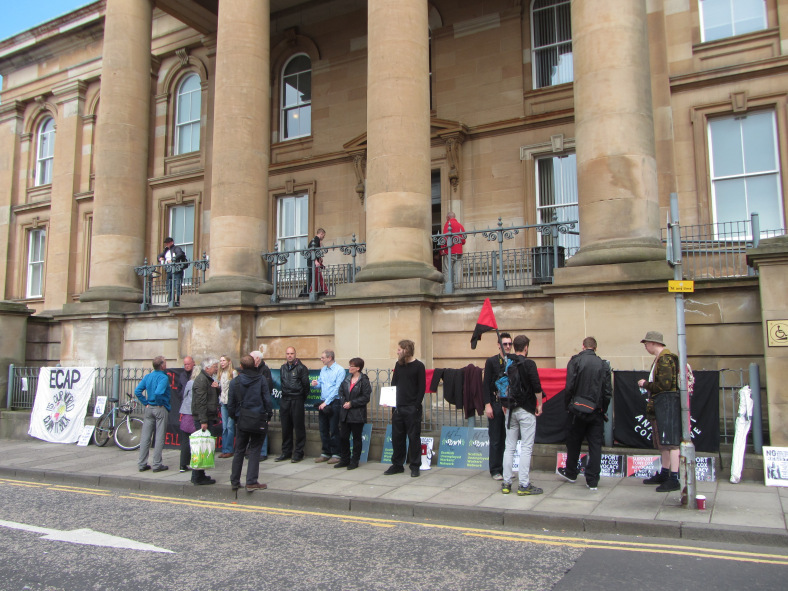 Now Tony is in Dundee Sheriff Court again this Thursday 23 June on charges of threatening behaviour (the court heard that he argued with Maximus employees the claimant had the right to be accompanied). Solidarity demonstrators from Scottish Unemployed Workers Network, Dundee Against Austerity, Edinburgh Coalition Against Poverty, Glasgow Anarchist Collective, the Action Against Austerity network and more will be at the court. When Tony was in court two weeks ago there was not only a court demo but solidarity demos at jobcentres round Britain, Glasgow, Edinburgh, London, Doncaster, and Cardiff. But we need much more. We need outrage. We need hundreds of people besieging Dundee Sheriff Court on Thursday. This denial of basic human rights isn’t an isolated incident. In 2015 Tony was also arrested at Arbroath Jobcentre, when accompanying a claimant. Forfar sheriff court found he had not committed any offence whatsoever in the Jobcentre; after the DWP witnesses had given evidence, the prosecution decided to withdraw the substantial charge. Scottish Unemployed Workers Network are outside jobcentres virtually every week, informing and supporting and accompanying claimants into the Dundee Jobcentre. The DWP seem determined to stop this front-line advocacy. They are probably worried that Dundee’s position as the Sanctions Capital of Scotland is under threat. The Tribe of Moles and our friends in Edinburgh Coalition Against Poverty (ECAP) have had the polis called on us several times by DWP bosses at Edinburgh’s High Riggs jobcentre On 29 February this year four G4S security guards physically stopped the ECAP advocate accompanying a claimant to High Riggs Jobcentre. This bullying and denial of basic rights happens at jobcentres every day. I was chatting about Tony’s court case in a community kitchen in Muirhouse recently and a guy told me how he had accompanied his son to make a benefit claim – and the security guards had tried to stop him going in. And, he said, a relative had had the same thing happen when he accompanied his own daughter. We need to be prepared to act to enforce this right. After the ECAP advocate was stopped at High Riggs in February, we organised. We returned to the jobcentre a week later with over 50 supporters, people attending from Glasgow, Greenock, Dundee – Tony Cox was there. The DWP gave in, and our advocate accompanied the claimant with no problems. And in the appointment, instead of the usual harassment, the DWP official was all sweetness and light. For years, A4e’s Edinburgh office denied claimants the right to be accompanied to their Earl Grey Street office. We refused to give up – defying the police. The claimants refused to give up – defying sanctions. And in the end A4e gave in. This is what we need. But on a much bigger scale. We need to take direct action so that the authorities are more scared of us than we are of them. A counter power which can fight them back, and open up the possibility of real change. The brutal assault on the sick, the disabled and the unemployed in the UK is part of this class war. They want to make life on benefits so intolerable that workers in employment will be terrified to lose their jobs, and accept any crap wages and conditions. The attack on benefits and claimants is an attack on us all. Petitions, and web activism are not enough. We could look to France (no not that minor football tournament) but the strikes, blockades, occupations and direct actions sweeping France in resistance to the le loi travail attacking workers rights are the kind of response the Tribe of Moles would love to see here. Solidarity demo with Tony Cox Dundee Sheriff Court 23 June. Info on your right to be accompanied at all benefits appointments.
" We could look to France (no not that minor football tournament) but the strikes, blockades, occupations and direct actions sweeping France in resistance to the le loi travail attacking workers rights are the kind of response the Tribe of Moles would love to see here."